Pub on Jamaica Road a short walk from Bermondsey Station. Note: In Spring 2015, the Gregorian was taken over by Antic, and reopened in June 2015. We haven't visited since, so some of the information below is likely out of date. It's quite large inside, though some of the space is divided up into little booth-type things with half-height frosted glass privacy screens, and there's a sofa area at the back; a rather nice use of the space. There are benches and things outside where you can smoke. The Gregorian closed briefly in early 2010, and reopened in May 2010 under new management. 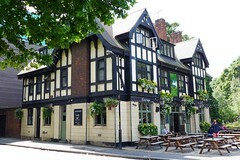 As of June 2010, the four handpumps are still present on the bar, but no real ale is available because the lines are damaged and it's not clear when or whether they'll be fixed. Kake visited on a weekday afternoon in June 2010; a pint of lime and soda was a rather steep £2.60. Service was friendly. Accessibility: One step up to get in, but then there's level access to the bar, almost all of the seating area, and the toilets; though access to the ladies' at least is via two rather narrow and heavy doors. Last visited by Kake, June 2010. Last edited 2017-11-02 17:42:38 (version 19; diff). List all versions. Page last edited 2017-11-02 17:42:38 (version 19).